Sneinton's three Community Organisers are settling in to their roles and have already listened to dozens of local people. The Organiser's job is to listen carefully to hear what local people want to change and then to support them to help make it happen. Anything said in a listening is entirely confidential and many people find it useful just to have someone listen to them properly for once! The Organisers will be door knocking around the Sneinton area, and will have full photo identity cards with them- you should always check carefully before letting anyone into your house. They will also be attending some local events and venues. If you don't want to talk, that's fine! But most of us do have something to get off our chests, and just sharing it with and Organiser can be the start of making a positive change to our lives and our area. It's worked many times before and it will work for Sneinton! You might get a card through your door that looks like the one on this page- please feel free to use the phone numbers or email addresses to contact the Organisers to arrange an appointment, in your home or somewhere else if you prefer. If you want to find out more about the Community Organisers scheme, you can visit our Community Organisers web page. 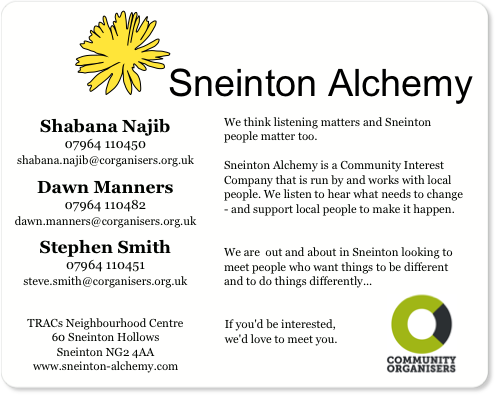 If you'd like to find out about Sneinton Alchemy's role as the Community Organiser 'Host' please email tom@sneinton-alchemy.com.